Discount Iron Mike MP-4 Pitching Machine - Free Shipping! The Iron Mike MP-4 pitching machine is the pitching machine of choice of major league baseball teams and is the most heavy duty, reinforced arm style pitching machine made. It throws up to 85 MPH and can hold 600 baseballs or 400 softballs - an entire team's worth of batting practice! The tank of Master Pitch's Iron Mike pitching machine series, the MP-4 includes extra reinforcements on the frame to protect the machine against batted balls and it also includes a Positive Feed Control Unit that keeps seamed balls flowing properly through the automatic feed system. If the extra reinforcement and/or feed control is not important to you, you might want to buy a Iron Mike MP-6 pitching machine, which is the same machine without the extra protection and positive feed control unit. The Iron Mike MP-4 is equipped with a heavy duty arm and hand system with a lockable arm guard cover, ensuring the pitching machine will last for many years. As with any arm style pitching machine, the MP-4 lets batters see the windup and pitch exactly like they would from a real pitcher - invaluable training for getting a hitter's swing timing down. Use it with baseballs, 11 or 12 inch softballs and even tennis balls - real, dimpled or lite balls. Because the Iron Mike MP-4 does not apply pressure to balls like wheel-style pitching machines, it can throw real balls without damaging the balls. Real balls last just as long with an Iron Mike MP-4 as they do with a real pitcher! Built to last by Master Pitch, very little maintenance is required - just check the nuts and bolts from time to time to ensure they are tight and grease the chain and apply oil in a few spots and you should get many years of use out of your Iron Mike machine. At 625 pounds, it is definitely not a portable pitching machine. 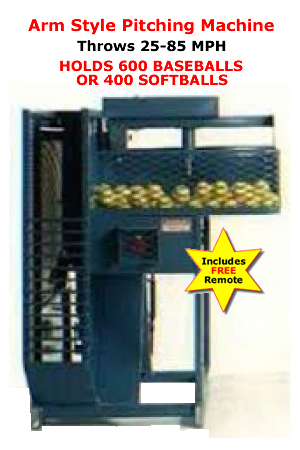 It's a machine that is best used in permanent batting cages and is powered by any standard 110 volt electrical outlet. The Iton Mike MP-4 includes hold-down clips for permanent installation. Also included with the MP-4 is a FREE remote control with an 80 foot long cord. This allows batters to start and stop the machine (no more missed pitches running back to the plate after the machine has been started). Get your Discount Iron Mike MP-4 now, while it is still at these low, introductory prices! Q: Can I add the remote control to my MP4 or 6 and at what cost. I have to check which one I have. What is an automatic feed control? Is that the curved bar that spins around? A: You can definitely add a remote control but you would need to buy that directly from MasterPitch, the manufacturer of Iron Mike pitching machines. We only sell them when they are purchased along with a pitching machine. The positive feed control unit helps seamed balls feed better. That, too, would need to be purchased directly from MasterPitch. Q: Can iron mike mp4 be set for random speed? A: No, the Iron Mike cannot be set up to throw pitches at random speeds. The balls would be anywhere from way too high in the strike zone to bouncing in front of the plate if speeds were random. There is only one pitching machine that I know of that is capable of throwing random speeds and also adjusting the vertical and/or horizontal pitching machine head angle to compensate for a "random" different pitch speed/type. It is the eHack Attack baseball only pitching machine and it costs about $9,000 for just the machine. An automatic ball feeder for that machine costs an additional $549 or $1,799, depending on the ball capacity that you need. You can convert it into a softball throwing machine for an additional $900, as well. Iron Mike MP-4 pitching machines can throw any type of baseball or softball (11 or 12 inch) - lite, dimpled or real balls. In fact, Iron Mike machines are the best pitching machines to use with real balls. Because no pressure is exerted on the balls, they last just as long as if they were thrown by a real pitcher. To ensure your satisfaction, Iron Mike MP-4 pitching machine motors are covered by a 1-year manufacturer's warranty. No matter where you order an Iron Mike MP-4 Pitching Machine from, NOBODY actually stocks them; they all ship directly from the manufacturer's warehouse located in Kansas City, Missouri. Therefore, the shipping time frame is exactly the same no matter what website you order from (we hope that it is this one!). Iron Mike MP-4 Pitching Machines typically take 1-2 weeks to ship from the time you place your order. They ship via general ground freight carrier and could take a week to two weeks to get to you AFTER being shipped, depending on your proximity to their warehouse. PLEASE NOTE: Iron Mike pitching machines are quite heavy and lift gate service is not included. It is your responsibility to get the pitching machine from the truck to wherever it is that you want the pitching machine. Expedited delivery IS NOT available!